We recently blogged about hardtail bikes, and why our customers like them. 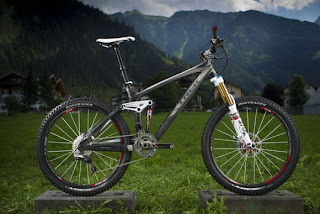 Today we are blogging about why folks choose full suspension mountain bike in Lexington. Your decision about suspension will be based partly on the type of riding you do, and largely on your personal preferences. Today, more people opt for full suspension than ever before. Full suspension bikes give a plush, smooth, unbelievably comfy ride. They have great grip on all kinds of surfaces, and absorb the stress of technical trail like a dream. If you like a bike that cuts through rough trails like a knife through butter, this is your kind of ride. Full suspension offers greater control, so you will feel comfortable and boldly go where you have never gone before. For cyclists who like the extreme technical trail, these bikes tend to be the preference. The modern models with full suspension will not slow you down the way these bikes did in a bygone era. With their speed and control, they are both excellent on the climb and graceful and fast on the descent. With the improvements of the last decade, full suspension bikes have become incredibly popular. These are not the awkward ugly dinosaurs they were in the 90’s- they are now super light, and look sleek and hot. A full suspension bike will weigh only about a pound more than most hardtails, so many riders find that the extra weight is worth the benefits of comfort and control. Full suspension bikes now come with rear suspension lockout mechanisms, which has made them much better climbers, formerly their great weakness. This feature and their new light design has earned them loyal following among serious cyclists. If you’d like to try out a full suspension mountain bike, we have a wide selection of Trek bicycles that are getting great reviews. Come by our shop in Lexington and try one out.